I think it's just a very interesting album. I'm not a fan of math rock, but when I like a Roadside Monument song I *really* like it. 'Crop Circles' and 'SRB' are just excellent. Despite only liking a few of their songs, I can't bring myself to part with 'Eight Hours Away...' or 'I am the Day of Current Taste'. Yeah, I agree. I can't say I like everything they've done. But despite my rather melancholic tone in the post, I also have fond memories travelling on the No. 9 after CU listening to this album. It's a very good album, even though there are probably only three or four decent tracks. Yes. 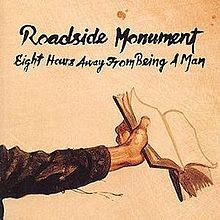 At the time, I felt like there was something pioneering about bands like Roadside Monument and Frodus (another band who did the odd song that I really liked, but I don't own any of their albums). 'Crop Circles' still manages to make me feel melancholy and happy at the same time. I think I appreciate them for their creativity rather than anything else. OK, I'm back again. I've just listened to the album again, and it's better than I thought it was. I think the problem is that I really don't like a couple of the tracks, but there are more good ones that I thought. 'Iowa Backroads' and 'Kansas City' are both a lot more solid than I remembered. Plus, I got the album a bit later than you, so listening to it always makes me think of the year in Herne Hill, which was one of the most carefree years of my life. Yes, 'Iowa Backroads' and 'Kansas City' are the noteworthy ones alongside 'Crop Circles', 'SRB', and 'My Hands are the Thermometers'. Eight Hours is by far RM's best album. Beside This Brief Hexagonal is alright, but little stands out; and aside from a couple of tracks, I Am the Day of Current Taste is mostly noteworthy for the song titles.